[通例単数形で; 通例 the stream] (時・思想などの)流れ，傾向. the stream of time 時の流れ. go with [against] the stream 流れ[時勢]に従う[逆らう]. an endless stream of cars [people] 絶え間なく続く車の流れ[人波]. I saw sweat streaming down his face. 汗が彼の顔を流れ落ちているのが見えた. Her eyes were streaming with tears. 彼女の目から涙が流れていた. People streamed out of the courtroom. 人々が法廷からぞろぞろ出てきた. The flag [Her hair] streamed in the wind. 旗[彼女の髪]が風に翻った. The moonlight streamed into the room. 月光が部屋に差し込んできた. The wound streamed blood. その傷口は血を吹いていた. The boys crossed the stream by stepping on stones. They tried to row against the stream. A stream of water is running down on the rocky wall. Tourists streamed into the waiting room. She stood on the hill, her long hair streaming in the wind. We waded across a shallow stream. To transfer data continuously, beginning to end, in a steady flow. Digital media that is delivered in a continuous flow across a network. Packets delivered by a Windows Media server that are consumed by clients without caching. For a Web server with Smooth Streaming installed, the experience is similar, except that the data can be cached by clients, though this can be prevented by applying Cache Control header directives in the Smooth Streaming feature. An abstraction of a sequence of bytes, such as a file, an I/O device, an inter-process communication pipe, a TCP/IP socket, or a spooled print job. The relationship between streams and storages in a compound file is similar to that of files and folders. From Middle English streem, strem, from 古期英語 strēam (“a stream, current, flowing water; flood”), from Proto-Germanic *straumaz (“stream”), from Proto-Indo-European *srowmos (“river”), from Proto-Indo-European *srew- (“to flow”). Cognate with Scots strem, streme, streym (“stream, river”), North Frisian strum (“stream”), West Frisian stream (“stream”), Low German Stroom (“stream”), Dutch stroom (“current, flow, stream”), German Strom (“current, stream”), Danish and Norwegian Bokmål strøm (“current, stream, flow”), Norwegian Nynorsk straum (“current, stream, flow”), Swedish ström (“current, stream, flow”), Icelandic straumur (“current, stream, torrent, flood”), Ancient Greek ῥεῦμα (rheûma, “stream, flow”), Lithuanian srovė (“current, stream”) Polish strumień (“stream”), Welsh ffrwd (“stream, current”), Scottish Gaelic sruth (“stream”). 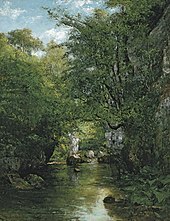 A small river; a large creek; a body of moving water confined by banks. European adventurers found themselves within a watery world, a tapestry of streams, channels, wetlands, lakes and lush riparian meadows enriched by floodwaters from the Mississippi River. A thin connected passing of a liquid through a lighter gas (e.g. air). Any steady flow or succession of material, such as water, air, radio signal or words. A new stream of migrants is leaving the continent. It threatens to become a torrent if the debt crisis continues to worsen. (sciences, umbrella term) All moving waters. (computing) A source or repository of data that can be read or written only sequentially. (figuratively) A particular path, channel, division, or way of proceeding. Haredi Judaism is a stream of Orthodox Judaism characterized by rejection of modern secular culture. (Britain, education) A division of a school year by perceived ability. (intransitive) To flow in a continuous or steady manner, like a liquid. When I came to myself I was lying, not in the outer blackness of the Mohune vault, not on a floor of sand; but in a bed of sweet clean linen, and in a little whitewashed room, through the window of which the spring sunlight streamed. (intransitive) To extend; to stretch out with a wavy motion; to float in the wind. A flag streams in the wind. (transitive) To discharge in a stream. The soldier's wound was streaming blood. (Internet) To push continuous data (e.g. music) from a server to a client computer while it is being used (played) on the client. From Proto-Germanic *straumaz, from Proto-Indo-European *srowmos (“river”), from *srew- (“to flow”). Germanic cognates include Old Frisian strām (West Frisian stream), Old Saxon strōm (Low German Stroom), Dutch stroom, Old High German stroum, strōm (German Strom), Old Norse straumr (Norwegian straum, Danish strøm, Icelandic straumur). Extra-Germanic cognates include Ancient Greek ῥεῦμα (rheûma), Polish strumień, Albanian rrymë (“flow, current”).